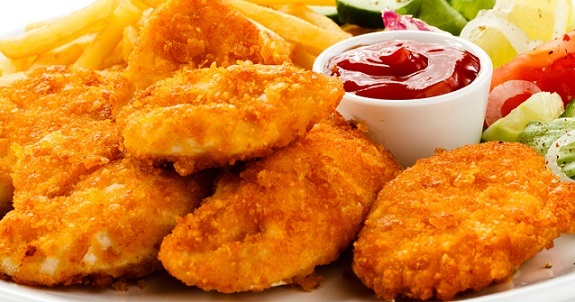 Breadcrumb and cheese coated chicken chunks baked until golden, this Baked Chicken Nuggets recipe is super easy and we guarantee your whole family will love it. Serve them with ketchup or barbeque sauce. They make for the perfect party appetiser or fun evening snack! Combine the breadcrumbs and cheese in a bowl. Pour the olive oil in a separate bowl. Spread out the chicken pieces on a large flat plate and season them with salt and pepper. Let them sit for a couple of minutes. Put the seasoned chicken pieces into the olive oil and toss gently to coat them with oil nicely. Now roll them in the breadcrumb – cheese mixture and place them on the greased baking sheet. Lightly sprinkle some more cooking spray on top of the nuggets and then place the baking sheet into the oven. Bake for 6 – 8 minutes and then turn the pieces over. Bake for another 5 minutes and remove from the oven. Serve hot with choice of sauce.